Linda, Sheena, Dr. Weissplatz, and Eleanor live in Salem. They are settlers; they struggle to be good. Dr. Weissplatz heals the children from illness. Linda buys Sheena a dress. Eleanor helps the doctor though she is a witch. Sheena likes to sing hymns. They plan a pageant. Linda and the doctor have an affair. At the pageant, Munoz Teddy appears, Linda's former lover. At the town meeting, Eleanor accuses Linda of adultery. There is a trial. Linda is judged. An effigy is burned. 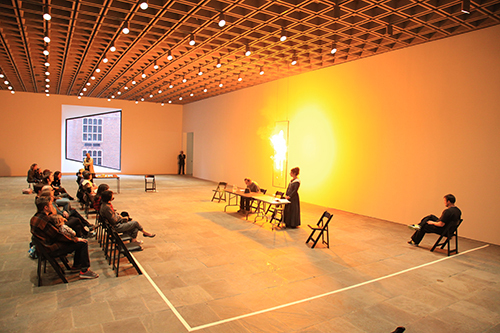 For the 2012 Whitney Biennial, New York City Players rehearsed a play in public.